This comment refers to the article available online at https://doi.org/10.1007/s00540-019-02612-w.
An author's reply to this comment is available online at https://doi.org/10.1007/s00540-019-02634-4. We read with great interest the study by Tsujikawa et al. 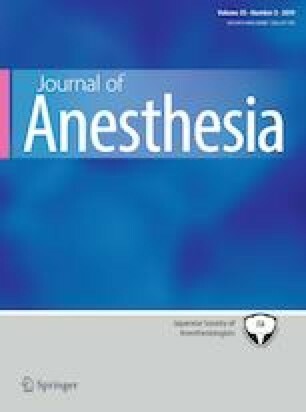 , which excellently evaluated the hemodynamic-stabilizing effect of dexmedetomidine in carotid endarterectomy. Since perioperative hemodynamic stability is important in this high-risk surgery, the results of their study have potentially great clinical impacts in our clinical practice. However, the dose of nicardipine and plasma norepinephrine level are only surrogate markers of hemodynamic stability. Although incidences of adverse events were compared, study power to detect any difference in these clinical outcomes was insufficient due to their low incidence. As the authors correctly addressed, larger sample size would be required. Although in a different setting of cardiac surgery with a higher incidence of adverse events, a previous study reported that dexmedetomidine reduced 1-year postoperative mortality, and overall complication rates . For non-cardiac surgery, a recent meta-analysis reported no significant difference in postoperative all-cause mortality, myocardial ischemia or infarction . However, in this meta-analysis, only four small randomized trials were included for these outcomes. Larger clinical trials are still required to corroborate the benefit of dexmedetomidine for the clinical outcomes in non-cardiac surgery.